Cat Mate Elite Super Selective ID Disc Cat Door Review - Is It Reliable? 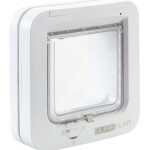 The Cat Mate Elite Super Selective is an automatic cat door that uses RFID “Radio Frequency Identification” technology to unlock the mechanism for the cat to push and enter. The cat wears a programmed RFID collar tag with a unique ID that gets read by a control panel and unlocks when recognizing the ID. 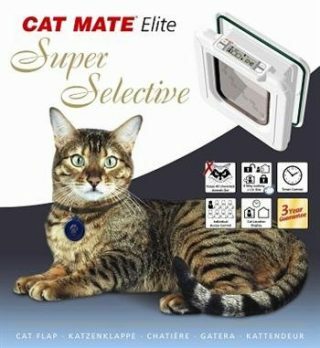 Cat Mate Elite Super Selective is a very safe way of access control for pet doors, because only animals with a programmed RFID collar tag can exit or enter the door. The unit includes 2 collar ID for you to program. Cat Mate accepts up to 8 ID’s in its memory, controlling the entry and exit for up to 8 cats and keeping all the unwanted animals out. If you have more than 2 pets you can purchase extra tags separately. Cat Mate Elite features selective entry and exit access control by its special locking mechanism that locks from the exit and entry. This way you can program individually which cat will be indoor-only and which will have free access to the outside. 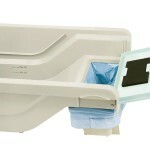 The unit offers a 4-way locking system: in & out, in only, out only, locked. 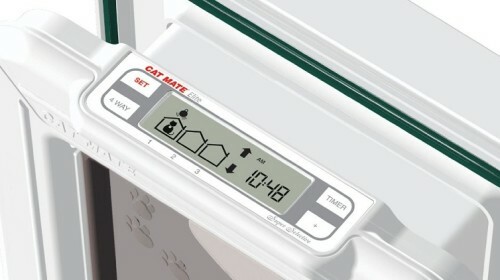 Cat Mate Elite Super Selective has a timer which allows you to program an outdoor schedule for your cat. 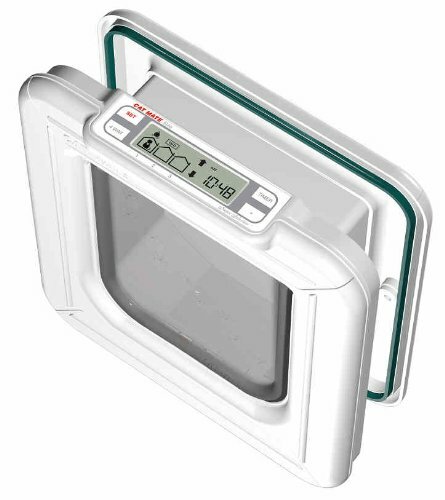 The unit features a LCD screen that displays the programmed entry and exit lock status, cat location (if in or out) and the time the door was last used by that unique ID cat, up to 3 cats. Cat Mate Elite door uses 4 AA batteries that last approximately 6 to 9 months, depending on the use and batteries. Batteries are not included. Only cats with the programmed collar tags can enter or exit the door, according to the settings. Selective control access from exit and entry. With unique ID collar tags you can decide which cat will be indoor-only and which, outdoor. LCD screen displays selected entry and exit lock settings, cat location (if in or out), and last time the door was used by that unique ID, you can check location up to 3 cats. Unit includes 2 Electronic ID tags (can be programmed up to 8 unique ID discs). Frame-lining up to 2” (50 cm), suitable for most installations. Extra liners for wall installations (available to purchase separately). 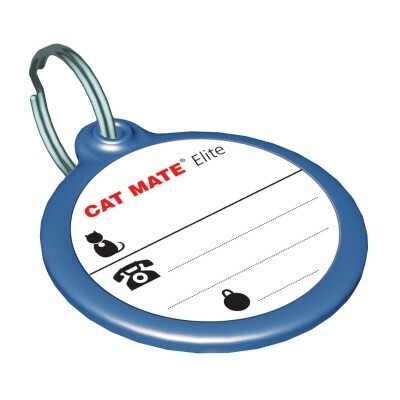 Cat Mate Elite Super Selective consists of a control panel or “reader”and a collar tag with a microchip acting as a “key” for the control panel to read. When the programmed unique ID located on the cat’s collar gets read and recognized by the control panel, a solenoid unlocks allowing the cat to push the door with its head, nose or paw and get through. The activation distance is a few inches and the disc has to be facing the reader otherwise, the tag won’t get read thus the mechanism won’t unlock. The cat door takes about 1-2 seconds to unlock after reading the unique ID and 2-3 seconds to lock (depending on your setting), giving the cat enough time to clear the door of its tail. When unlocking, the mechanism makes a “click”noise and the cat learns it is OK to push to enter. After the cat has cleared the door of its tail, the pet door will make a noise when locking. The locking mechanism consists of little pegs that pop up from the frame into the base of the door, this way the cat door has the ability to lock the exit, the entry or both directions, depending on the settings. This is why the Cat Mate Elite Super Selective is advertised as raccoon-proof because the locking mechanism does not relay in an external solenoid or a latch that could be easily manipulated by a raccoon or smart cat. Cat Mate Elite works with RFID collar tag, but if your cat has microchip implant, this won’t interfere with the proper operation of the door. In & Out: the cat wearing the collar tag has free access to exit and entry. In-Only: the cat can enter the door, but it can’t get back out. Out-Only: the cat can exit the door, but it can’t get back in. Locked: the cat door is completely locked. The timer allows you to set an “outdoor schedule” for your cat. For example, if you want your pet to exit the door only from 9 am, and stay inside from 8 pm, you can do that with this pet door. If you have several cats the timer won’t be able to selectively determinate which cat will stay inside or outside at certain times, the schedule of the timer is for ALL CATS. According to the example, all felines will be able to get out at 9 am or later, and they will all stay inside after 8 pm. If happens that one of your cats did not get inside before the time you setup to stay inside, the mechanism won’t get your pet locked out, he or she will still be able to get in after the programmed time, just won’t be able to get back out. 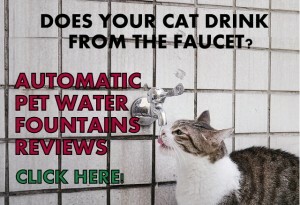 IS IT HARD FOR A CAT TO USE IT? The cat needs to learn how the system works to use it correctly, without hesitation, straight to the point. First, the cat has to nudge the door with its nose, head or paw so the sensor starts looking for its microchip (disc/tag). Once the sensor registers the number and recognizes it, it unlocks. This makes the pegs disengage, making a little click. The cat needs to recognize this click and then push the door to walk through. If the cat hesitates and stays at the same point and not entering the door, the unit will lock again, making the process longer. In general, cats adapt well to this pet door, they just need a proper training. Cat owners need patience to train and to wait until the cat feels confident to use it. This might take from days to even a month, depending on the cat. Eventually, all cats end up using the door if the adventure is waiting for them out there! 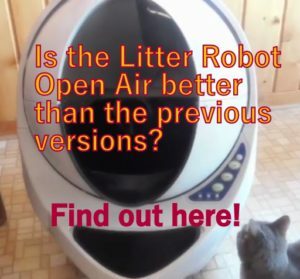 Cat Mate Elite Super Selective features a “training mode” setting which allows the cat exiting and entering the door without having to use microchip or waiting for the “click” noise to push. With the training mode, the door is like a non- automatic pet door. This tip applies to cats that have already used a non-automatic pet door and they know how to push the door to get in. The most important thing is to make sure your cat won’t encounter the unlocking sound the first time while pushing the door with its nose or head trying to get in. 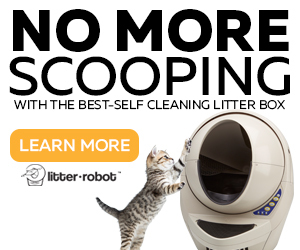 This might scare your cat to the point of never wanting to use it again. To avoid this, you can trigger the locking system intentionally several times while your cat is somewhere in the house and eventually your feline friend will come to investigate. The encounter of your cat with the pet door will be different this way and your kitty will get used to this noise and it will know it’s not a threat. You can reward your cat’s courageousness with treats in the process. Once your cat gets used to this noise, he or she can start using the door with the microchip mechanism. If your cat has never used a cat door, the owner’s manual has instructions how to train your cat. The standard installation does not take more than 30 minutes. Most of this time is for measurements. Once you have cut the opening it will be only a matter of drilling two holes on sides and screw the two halves tight together. It is a good idea to check very well where to install the pet door because the microchip tag needs to be at exact certain level to be read by the scanner of the door so if you mount the door too high or too low, the microchip might not get read. However, the instructions are very clear and if you follow them correctly, you should not have issues. The installation in flat wood doors is the easiest. After the right measurement, draw the hole on the door, cut the hole, drill two screw holes (one in each side) and screw the two halves together. Installation in metal doors takes a little longer. When installing in a metal door the door can’t touch directly the metal because this will interfere with the RFID signal. In general it is not recommended to install the cat door in glass panels that have too much condensation. It is recommended to hire a glazier to cut the hole in the required position and follow carefully the instructions to install the cat door. It is not possible to cut a hole in a double glass, you have to get a new one with the hole cut in it. 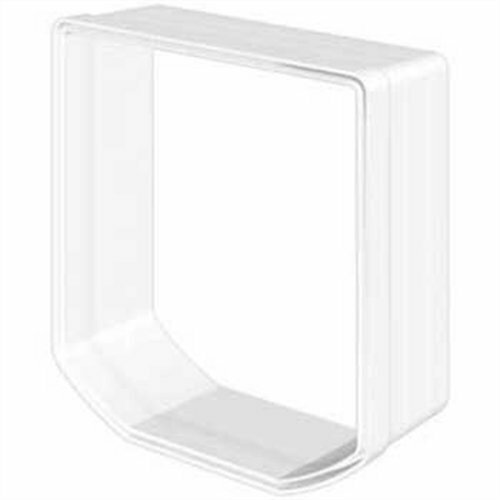 If you want a simpler installation, you might want to replace the glass panel for Plexiglass and proceed as the basic installation. You need to get wall liners to install the door in a wall. If a wall is very thick, liners can be added together with Elite range. A liner’s depth measures 1.96” (50mm). As the pet door does not lock in “training mode”, the solution is to tape the microchip disc to the inside of the cat door. This way, with the proper setting, the door will always open since the chip is right there to be read by the scanner. Your cat won’t need to use a collar tag and with the timer, it will be locked in at night and will have freedom in the morning to get out without your intervention. The only issue of setting up the cat door this way it is the extra use of batteries, but it will be the cost to quit the “doorman” duty. 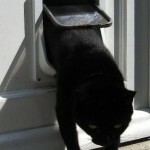 WHAT ARE THE PROS & CONS OF CAT MATE SUPER SELECTIVE CAT DOOR? 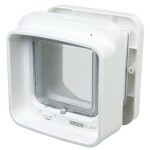 It features a selective exit and entry control, you can define which cat will be indoor-only and which, outdoor. 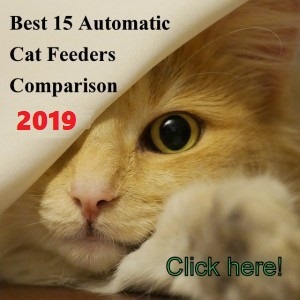 With a timer that allows you to set an “outdoor schedule” for your cat or cats. LCD displays the chosen setting for each cat, which cat is in and which out and last time the door was used. Internal locking system that can’t be manipulated by animals from the outside. Ability to stop raccoons effectively. Length of time to lock shut can be adjusted to your cat’s need so it gives your pet enough time to clear the door of its tail. It swings much quieter than other cat doors brands. It has low battery indicator. 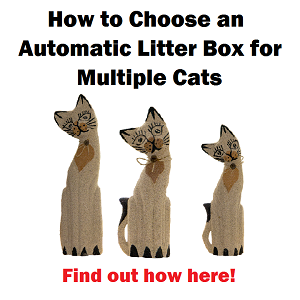 It can be set in training mode for your cat to get used to it without wearing microchip. 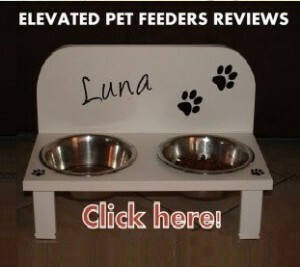 If used in a feeding station you can check if your cat has eaten. It doesn’t leak much air in comparison to many other cat doors on the market. The door makes a noise when unlocking, similar to the noise level of a deadbolt lock. (this might scare your cat if not introduced to it properly). The microchip discs are a little big for a cat, but they are lightweight. The unit does not seem to work very well in solid metal doors. Tags don’t have a low price (a “Con” if your cat keeps losing its tag). Tag needs to be very close to the panel and facing it to get read. Door opening not suitable for large or overweight cats. Good for medium size cats. Timer does not work individually for each ID, it works for all IDs (e.g. all cats stay in at 7 pm). Hard to place batteries into the compartment (you will do this every 6 months or so, not a big deal). Occasionally the door locks in the wrong position, leaving the door stuck (this does not happen often and only when cats takes too long to enter the door). Screws are not very high quality. Make the door/door opaque, taping it or similar. You will achieve two things by doing this: 1) this will discourage your cat from looking outside which could unlock the door unintentionally if sitting too close 2) will discourage raccoons or other cats from snooping inside, which gets them more motivated to get in. If the door got locked with the pegs out, the best way to reset the unit is using “training mode”. Simply push the program and 4-Way button together for 5 seconds. The “program” button is located under the battery cover. This resetting retracts the pegs and the door can swing back to original position. Then, you have to push the same buttons again to reset the door to its programmed setting. By doing this, you don’t need to reprogram the ID’s. Make sure your cat’s tag is facing the control panel’s reader. If not, the scanner won’t be able to read the cat’s tag. Cat Mate Elite Super Selective is a good cat door that works as advertised. This unit is a better option than its electromagnetic version. 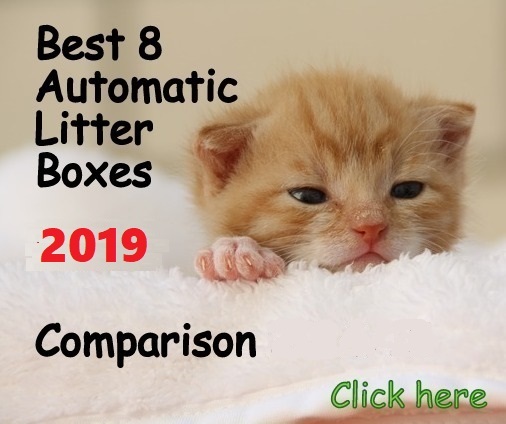 Cat Mate Elite’s ability to selectively recognize which cat can exit and/or enter, plus the timer that allows you to set “outdoor schedule” for your cat or cats, makes this unit a very good choice for cat owners that have more than one cat and need all these features. The door only works with collar tags and not with implanted microchips, so if your cat is a crazy climber or a bullier, you’d like to rethink if it’s a good idea your cat wearing a collar with a tag hanging. The unit might not work well with indecisive cats, those cats that are always “thinking” which next step to take, because the door needs certain time for the cat to be completely inside and clearing the door from its tail to lock correctly. Hi, great review…actually purchased and installed one…do you know why it would be constantly going in and out of training mode? tried resetting it already. Hello Dante, you can call to customer service at 800 725 4333 and they’ll help you with that.